General Motors will invest half a billion dollars into Lyft, part of which will involve self-driving car development, the company said Monday. Ford followed with the Tuesday announcement that it would add another 20 autonomous hybrid Fusions to its 10-car test fleet. And NVIDIA on Monday announced DRIVE PX 2, which can conduct 10 times more deep learning operations per second than the DRIVE PX in use by 50 automotive companies. The moves, announced during Consumer Electronics Show week and one week before the North American International Auto Show in Detroit, may hasten the introduction of partially and fully self-driving cars in America, and collision repairers should pay attention. Besides self-driving car research, GM’s $500 million investment into Lyft gives GM a seat on the Lyft board, makes GM the “preferred provider” of short-term Lyft rental cars (think carless residents borrowing one for a couple hours of errands), and brings OnStar to Lyft users and drivers, according to a news release. GM offered few other details, describing only “a network of on-demand autonomous vehicles will leverage GM’s deep knowledge of autonomous technology and Lyft’s capabilities in providing a broad choice of ride-sharing services” in the news release. 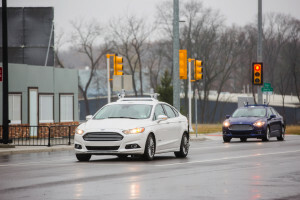 Ford, the first OEM to use the University of Michigan’s Mcity, said it will by the end of the year have 30 Fusion hybrid test vehicles on the roads in California, Arizona and Nevada, with the 20 additions using the newest LiDAR equipment from Velodyne. The new Fusions will be on the Ford’s third-generation autonomous platform. Ford’s second-generation tests had the goal of reaching SAE International Level 4, in which the human driver truly isn’t necessary, and it moved to the engineering stage of the tests in the summer. Testing will employ a newer LiDAR, known as the Solid-State Hybrid Ultra PUCK, with a small enough footprint that Ford only needs two, instead of four sensors. The new PUCKS can “see” 200 meters, “making them the first auto-specific LiDAR sensors capable of handling different driving scenarios,” Ford wrote in the news release. ”Adding the latest generation of computers and sensors, including the smaller and more affordable Solid-State Hybrid Ultra PUCK Auto sensors helps bring Ford ever closer to having a fully autonomous vehicle ready for production,” Ford autonomous vehicles technical leader Jim McBride said in a statement. Ford is also hedging its bets with “supplemental features and duplicate wiring for power, steering and brakes” which “will act as backups, if needed,” according to the news release. That’s an intriguing peace-of-mind step which, if brought to dealership self-driving cars in the future, could mean more equipment for repairers and mechanics to fix. NVIDIA CEO Jen-Hsun Huang on Monday discussed the DRIVE PX 2 next-generation brain for self-driving cars. The device can use 8 teraflops of processing power — “the processing power of 150 MacBook Pros” — to make decisions on the fly, according to a NVIDIA Blog post Monday by Bob Sherbin. It’s also only the size of a lunchbox, while other self-driving technology “takes up the entire trunk of a mid-sized sedan,” according to Sherbin’s post. 100 Volvo XC90s (of course!) will be the first vehicles to test DRIVE PX 2, driving themselves around Gothenburg, Sweden, “and semi-autonomously elsewhere,” according to Sherbin. The computer also can use sensors to “see” 360 degrees around the car. “The rear-view mirror is history,” Jen-Hsun Huang said, according to Sheridan. NVIDIA’s deep learning technology, which is how self-driving computers grow smarter and better at making decisions, already has been used by Ford, BMW, Audi and Daimler, Sheridan wrote. Self-driving gains will cut into collision repair business, as human error is estimated to cause 90 percent of crashes today. Quite frankly, it’s hard to see how a computer — even one in beta — wouldn’t have a better batting average than that. Worse for shop bottom lines, even limited self-driving capabilities — auto-braking or autonomous city gridlock/freeway driving — on or near the market today can apply to the most frequent crash situations. Self-driving car champion Volvo estimates that 75 percent of crashes take place beween 0-19 mph, and 50 percent of all rear-end crashes saw the rear-ending driver not braking at all. Those autonomy-lite technologies will likely improve as OEMs near full self-driving capabilities and regulators grow happier with the idea of a vehicle making decisions. So it behooves collision repairers to keep an eye on such advances — and also prepare to properly scan, calibrate and fix cars equipped with partial and full autonomy.